Things Look Different in the Light is the first selection of work by the late Spanish writer Medardo Fraile to be translated into English, permitting Anglophone readers access to these unusually delightful, lucid, short, intimate stories, contemporary yet as resonant as old folktales. Though the book is but 220 pages long, it contains nearly 30 stories, some as brief as three pages. Despite their brevity, Fraile’s stories contain worlds, and are marked by a distinctive, singular style, a lightness of touch, and a sense of wonder at the marvelous strangeness of what’s around us. Fraile finds his subject matter in the quotidian, in the micro rather than macro (or so it might seem, anyway), in the delicate, nuanced interactions between people, whether intimates or strangers. Even the titles of his stories suggest this closeness to the everyday: “The Shirt,” “The Chair,” “The Car,” “The Lemon Drop,” “Restless Eyes,” “What’s Going On in That Head of Yours?” One feels in his stories the magnitude of the minutest event, how it can alter perceptions, directions, even whole lives. The thing is that miracles happen so often, they seem normal to us, the morning comes then the night, the sun and the moon rise and set, the earth gives us harvest after harvest, and we say, ‘I’ll do that tomorrow’ and tomorrow we’re still alive to do it. My dear, you’re right: reality is a miracle. Lupita was momentarily ignored and she remembered that, before Berta had arrived, someone else had been about to speak to her. And she turned her head, looking at everyone there, one by one, until she found him: Jacobo. Eyes wide, gaze fixed on him, she urged him to say his sentence. It’s a story that offers tremendous deference and respect to children – and to the importance of communication. One emerges from Fraile’s small stories with an amplified awareness of the impact of one’s smallest actions, of the myriad ways a word or gesture, a glance, an accidental sighting of something or someone, can transform a moment, often without our knowing exactly what the consequences may be. These are deceptively simple, slyly penetrating stories, full of charm, full of traps. You too may find yourself changed. 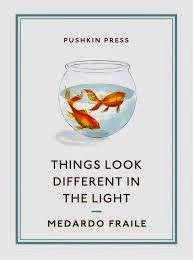 Things Look Different in the Light, by Medardo Fraile, is translated by Margaret Jull Costa and published by Pushkin Press, 2014.